You have divinity encoded within you and it is simple and easy to communicate with it. You have a unique purpose as a human being. The universe has a plan to help you pursue your dreams, find meaning and joy in your life, and feel happier, freer and more fulfilled—-today. Through a spiritual explanation of the concepts that inspired quantum physics and string theory, and using energetic encoding to effect conscious and subconscious perceptual change, The Sharing will radically shift your life into a happier world of possibility, non-judgment, and gratitude. 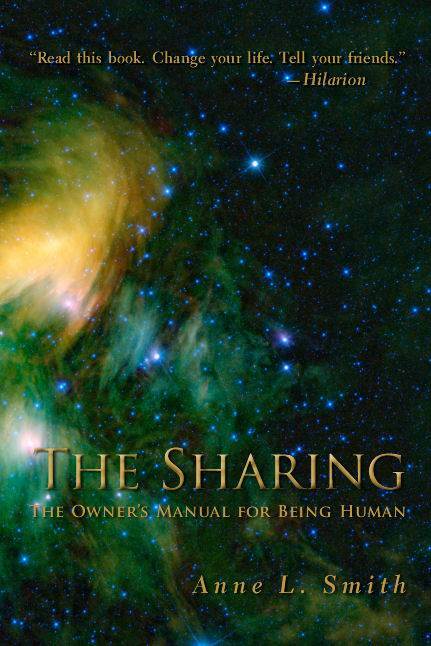 Written in the language of the soul rather than the language of the mind, The Sharing: The Owner’s Manual for Being Human provides a more joyful, carefree, even, and practical way of perceiving life’s ups and downs. It will change the way you see life and experience the world—here and now. The layout is clear and organized, and included bonus exercises clarify the concepts via real-life scenarios. A book to shift your life paradigm. Read this book, change your life, tell your friends! Buy the book at Amazon. Enjoy the benefits of one-click shopping, Amazon Prime shipping (for subscribers), and secure processing at a site you know and trust. Buy the book at Barnes and Noble, where it ships free with $25 of eligible purchases.